I realize you’re busy. I know you’re in a constant swirl of work and chauffeuring duties and appointments missed and that you can’t be expected to pay attention to certain details when it comes to slamming down food for the nits. Especially since they’re off school today. 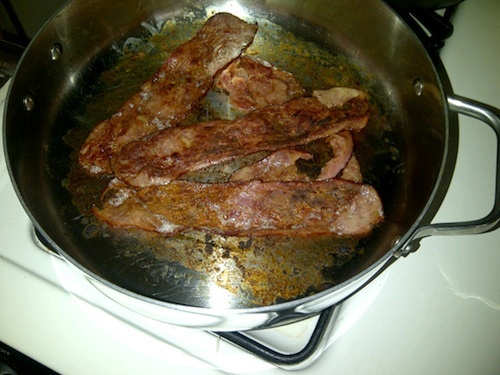 None of this is an excuse to fry up turkey bacon in a pan without any fat. I am not a non-stick skillet. I am a rather pricey skillet that requires a certain level of care that you choose to ignore. What did you think would happen when you tried to fry turkey bacon in me? That the fat from this “low-fat” product would suffice to keep the bacon from burning into the bottom of me? What about trying to scrape the bacon off with a plastic spatula? Do you ever think these things through? Do you enjoy ruining your expensive pots and pans in this manner? Not to mention your cheap utensils. You’ve been so accused in the past — I’ve heard it myself from the pantry — but I think sometimes you do this on purpose just for the blog fodder. In the future, I beg you to pay more attention. You should know better, certainly by now. Welcome to the wonderful world of deglazing!